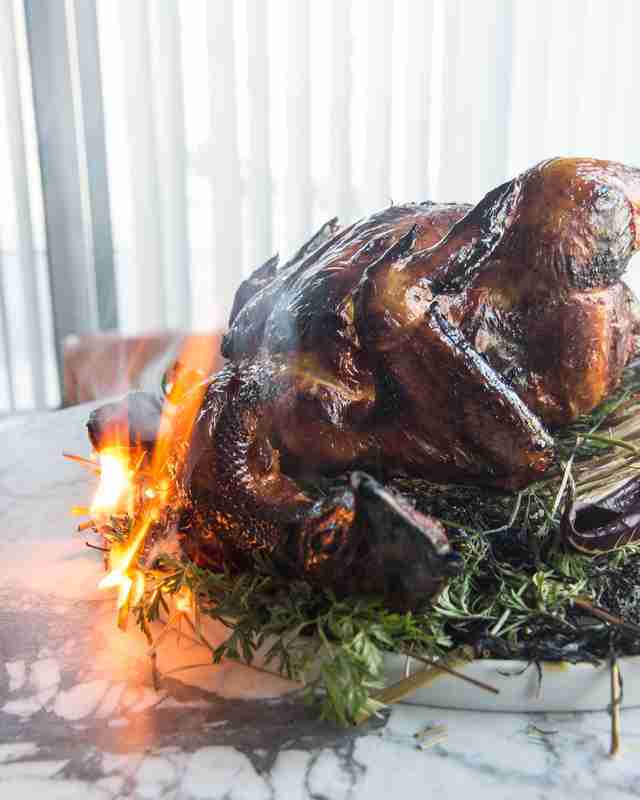 Ever since Proechel introduced the dish, whole roast chicken has hit the NYC restaurant scene like, well, a bird out of hell. The same month Le Turtle debuted, Chef Erik Ramirez opened Llama Inn in Williamsburg and began hawking his signature Peruvian pollo a la brasa to ravenous crowds. 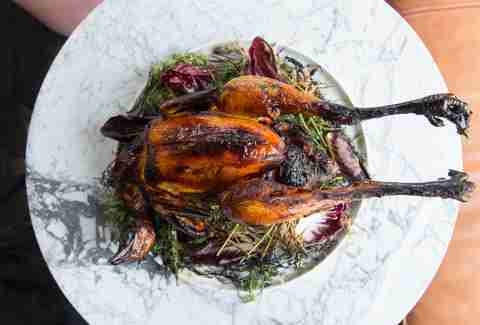 And in February, Michelin-starred Chef Antoine Westermann opened the New York City satellite of his popular Paris-based Le Coq Rico, where he features a much raved about $96 rotisserie Brune Landaise prize bird. Before this frenzy, there were other flaps in the industry, like Andrew Carmellini’s whole fire-roasted garlic chicken at Locanda Verde, and Daniel Humm’s foie gras, black truffle, and brioche-stuffed masterpiece for two at The NoMad. But how did the boring bird finally emerge as the hottest item on the menu? For starters, the birds are different. In February of 2012, Mark Sarrazin, president of meat and poultry purveyors Debragga & Spitler Inc. -- which provides everyone from Daniel Boulud to David Chang to Ramirez of Llama Inn with products -- made the decision to stop selling cheaper (sometimes by half the price) commodity poultry, like Perdue, and ever since, sales have grown double digits. In contrast to the sad flocks cooped up wing-to-wing in dark sheds on industrial farms -- the stereotype that’s ravaged the bird’s reputation, Proechel’s Sasso eggs are hatched in Quebec and then raised on small farms in Pennsylvania. Westermann spent a year researching chickens before selecting the locally bred Brune Landaise as his top bird -- originally from southwest France, it’s raised for 110 days (as opposed to the unnaturally fast commercial standard of just 40 days). Both Humm and Ramirez use birds raised humanely in Lancaster County, PA by Mennonite farmers sans antibiotics. 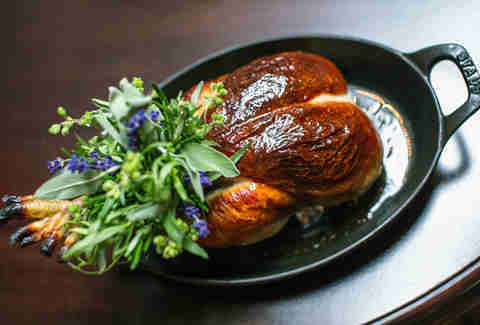 According to Humm, the roast chicken is the only entree that’s remained on the menu at The NoMad since opening day in 2012. And in the few years since, they’ve sold 70,000 of these de-feathered friends. “We have regulars that come in just for the chicken and a glass of wine or a cocktail every single time they visit." 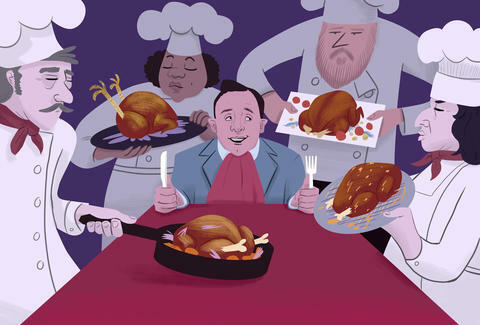 “I’ve always thought the great mark of a chef is if they can roast a chicken." The kitchen at The NoMad takes a unique approach: instead of brining, they cure the chicken by stuffing a layer of foie-truffle-brioche under the skin and holding it for about a day in the refrigerator ("It really makes the chicken super luxurious,” Humm says). Then they roast it whole until the breast is perfect, remove it from the heat, and take off the dark-meat pieces, which cook slower, to finish on a pan and serve in a separate plate covered in hollandaise sauce. "The key is using the best ingredients and then making sure not to overcomplicate things," Humm says. "I think people are realizing there is more to roast chicken than they may have experienced decades ago. It’s not on the menu just to be a safe option anymore." Since day one, Proechel’s whole roasted Sasso chicken at Le Turtle has been one of the most hyped dishes -- not just at the restaurant, but in the entire city. The bird at Le Turtle arrives atop a pile of smoking fennel hay on a round platter, its neck gracefully bent around the body, its feet jutting straight back. The server allows a moment for diners to admire it in all its glory before carrying it at shoulder height across the sleek dining room and back to the kitchen, leaving a sweet aroma wafting through the room. Minutes later, it makes an encore, this time artfully arranged in deconstructed pieces on another plate, skin side up. The golden sheen glows under the reflection of the light. It’s almost too pretty to eat. But when you finally bite down on your first piece of dark meat, you get the crispy texture of the skin paired with sweetness from the brine. “It’s not on the menu just to be a safe option anymore." “You’d be surprised for something as stupid as a chicken, that there is so much work that goes into it,” says Proechel. He’s not joking. Every Sasso that lands in front of a diner has been meticulously prepped throughout a five-day process -- compared to his wagyu beef, which requires very little hands-on prep aside from simple grilling. The chicken prep begins with a 42-hour salt and sugar brine. And those 42 hours aren’t arbitrary. “I tried 24 hours, 48 hours, 36 hours... At one point, it reaches homeostasis. I was constantly tasting and putting on weight,” says Proechel. Next, the bird must be trussed and hung for a minimum of three days as excess fat drips off. “It makes crispy, cracked skin -- a pellicle, so the skin is thin, which helps with the cooking process,” he says. Any less, and it will be soggy. “You will just taste fat.” Before roasting, the birds are taken out of refrigeration, tempered, stuffed with herbs and citrus, and finally, seasoned with an in-house porcini salt, which adds even more unctuous flavor. At any given time, there are 150 chickens in the restaurant -- being prepped, roasted or eaten. And each night, their quota of 15 to 17 birds sell out. Meanwhile, just over the Williamsburg Bridge is Llama Inn, a bright spot located on the site of a former garage, along a rather dingy thoroughfare under a steady stream of BQE traffic. 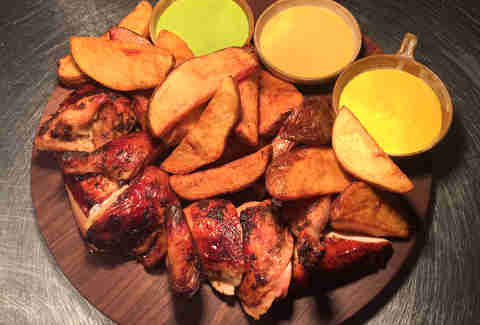 Each week, Chef Ramirez, who describes the style of cooking here as “Peruvian heart and attitude with what you can get in NYC,” goes through 110 chickens. The process, based on his Peruvian grandmother’s recipe, is also labor intensive: the whole chickens are cooked on a rotisserie after three-days of brining (six hours), an ice bath, blanching (which renders out fat allowing for crispier skin), marinating, and smoking. During service, the chicken is plated on a wood board with fat wedges of fried Kennebunk potatoes, and three sauces (aji verde with cilantro, roasted jalapeño; rocoto crema with red pepper, and garlic; and Huancaína sauce with aji Amarillo, queso fresco, and garlic.) It’s a decidedly different taste than Proechel’s more Peking duck-style bird. This one’s immediately smoky and more robust with spices and heat. Westermann says he knows when a chicken is fully cooked just by looking at the bird. “I don’t need to touch it,” he says in his thick French accent. “I speak with the chicken.” He’s kidding -- though the whimsical 70-year-old as bird whisperer does not seem so far from the truth. 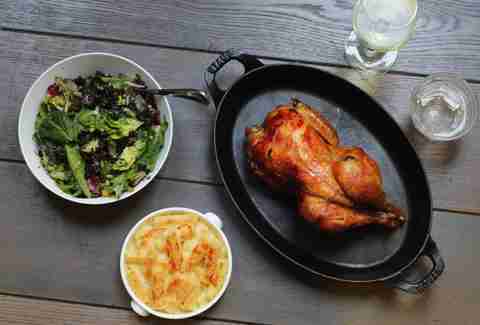 Like at Le Turtle and The NoMad, the servers at Le Coq Rico first present the whole chicken to the table. For first timers, the prize bird at Le Coq Rico is the Brune Landaise, but if you prefer something a bit gamier, go for the Plymouth Barred Rock, a heritage breed developed in the 19th century. The servers return with it carved up, alongside a small salad. Very methodically, they’ll set down a warm plate, ask for preference of piece, and put down one piece of chicken with a clove of roasted garlic. Next, they’ll tip a pot of jus over the single piece of chicken. The first bite is perfectly moist, hot, and flavorful. The skin is crispy on the outside with layer of caramelized fat on the underside. It’s juicy, clean, and the most classic of these four fowl renditions. Aside from the newfound quality options of birds NYC chefs now have access to, perhaps the most alluring aspect of the whole chicken is the wide assortment of textures and flavors you get from a single dish. The crispiness of the breast skin, the smoothness of the breast meat, the richness of the dark meat, the gumminess from the feet, the fatty yet crunchy skin over the thighs. Indeed, these chefs and their love affair with chicken are helping to usher in a new era of eating out -- no longer is the same old slab of red meat the prize item on the menu -- it’s the bird. Claudine Ko has binged on more chicken in the last two weeks than in the last two years, and she’s almost stuffed. Follow her on Twitter @lucidean and check out her other stories at www.claudineko.com.